iTunes movie rentals grabbed the limelight, but that service wasn’t the only digital-media announcement to come out of Steve Jobs’ Macworld Expo keynote last week. Overshadowed by the news that users could download iTunes rentals from all of the major movie studios was an announcement made by 20th Century Fox chairman and CEO Jim Gianopulous when he joined Jobs on stage—another Fox-Apple collaboration called iTunes Digital Copy. The Digital Copy is a new feature included with selected movies. When you buy one of these videos on DVD or Blu-ray, you’ll also get a version of the movie that’s compatible with iTunes and Apple's associated media players. The result? You’ll no longer need to use time-consuming—and legally questionable—methods, such as ripping your own DVDs using HandBrake, to be able to watch your movies on your iPod, iPhone, or Apple TV. With Digital Copy, you’ll have an iTunes-compatible version right out of the box. Though Apple hopes other movie studios latch on to iTunes Digital Copy, Fox is the only one participating right now—and with only one specific movie at the time of this writing. 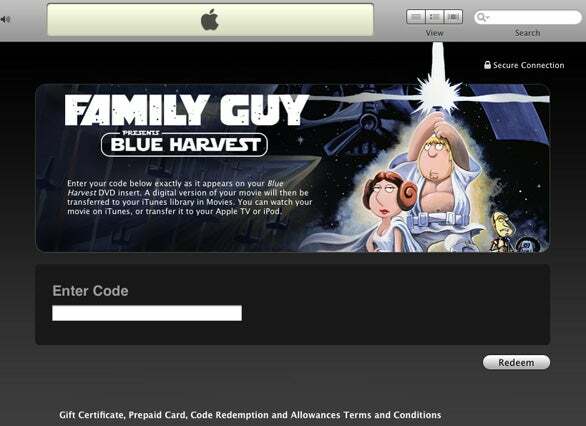 We plunked down $12.99 for a copy of Family Guy Presents: Blue Harvest, marked with a sticker advertising that it included the bonus Digital Copy. DVD in hand, we took a look at this new feature and how it works. Movies with an iTunes Digital Copy—called just Digital Copy on the packaging—actually include two discs: one for the DVD or Blu-ray copy of the movie and one for the Digital Copy. 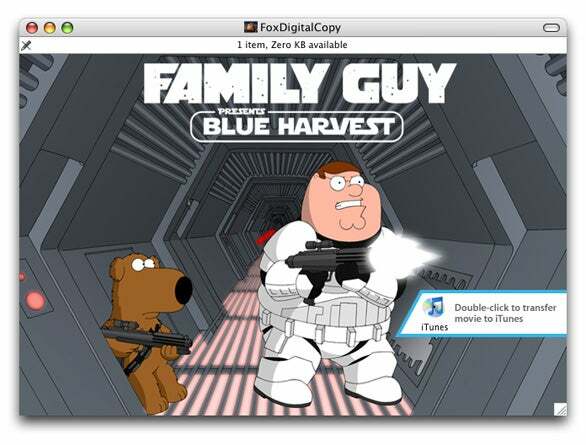 When you insert the latter into your Mac, the disc opens in the Finder to display a Blue Harvest image and an iTunes icon you double-click to transfer the movie to iTunes. The DVD package comes with an insert listing a unique serial number to unlock the Digital Copy. Type the number into the Enter Code field in iTunes and click on Redeem; if you aren’t currently logged in to your iTunes Store account, you’ll be prompted to do so. After iTunes connects to the Store, you’ll see a confirmation screen letting you know your attempt to unlock was successful; you’ll also see the Downloads item appear in iTunes Source List, just as if you’d purchased a movie from the iTunes Store. You can click on Downloads to view the progress, which is actually the progress of the movie file being copied from the disc to your iTunes Library. Thus, it’s much faster than actually downloading a movie over the Internet. Once the “download” is complete, the movie appears under the Movies section of your iTunes Library, just like any movie you may have bought from iTunes. You can play it in iTunes or Front Row, and you can transfer it to an iPod, iPhone, Apple TV, or another Mac. Unlocking the movie associates your iTunes Store account with the file using Apple’s FairPlay digital rights management (DRM) technology. (In fact, if you visit your account in the iTunes Store and click on Purchase History, the Digital Copy will appear in your list of purchases.) Thus, the same five-computer limit applied to iTunes Store purchases applies to Digital Copy movies. Once you’ve used the serial number included with the disc, that number is permanently linked to your iTunes Store account. If you put the disc in another computer using the same iTunes Store account, you’ll be able to use that same serial number to copy the movie to iTunes on that computer. However, if the other computer is using a different iTunes Store account, you’ll get an error that the serial number has already been used. (The same applies to user accounts on the same computer—if another user account is using the same iTunes account, the serial number can be used to copy the movie to iTunes.) If you want to watch the Digital Copy on a computer using a different iTunes Store account, you’ll need to manually copy the movie file from your computer—it will be in your iTunes Music folder—to the other one; of course, that computer still must be authorized to play your iTunes-purchased content. You can use iTunes’ Get Info feature to view detailed information about the Digital Copy of the movie; doing so reveals some interesting tidbits. For example, for this particular movie file, the audio bit rate is 124 kbps (two-channel stereo); the video bit rate is 1451 kbps; the video codec used is H.264; and the video has a resolution of 640-by-480 pixels. You’ll also note a new anti-piracy warning that appears to be present on all videos newly-available for rent or purchase on the iTunes Store. Overall, the process is quite simple, and the quality of the Digital Copy is comparable to the 640-by-480 videos you can buy off the iTunes Store. If you do experience problems, Apple provides a Knowledge Base page that includes links to troubleshooting articles. Fox also has FAQ and Support pages, although both provide little information for Mac users, as they focus on the Windows Media version of the Digital Copy. Assuming your goal is to watch your own movies on your own devices, the Digital Copy feature is much more convenient than ripping a movie yourself using HandBrake, MacTheRipper, or other DVD-conversion utilities. Those programs require you to extract the content of the DVD and then convert that content to a compatible video file—both slow processes. The main advantage of HandBrake is that it lets you convert your DVDs to higher-quality versions; for example, for copying to an Apple TV for watching on an HDTV. But if that’s something you want to do, you can still do so using the standard DVD included in the Digital Copy package. Perhaps the best news, if Blue Harvest is representative of future offerings, is that getting a Digital Copy doesn’t mean getting hosed at the checkout counter. The Blue Harvest DVD is currently selling for $13 to $15, which is about what you’d expect for a new release.